A delicious tart is the perfect summer treat. This story was originally published by New Zealand Women's Weekly and is republished with permission. 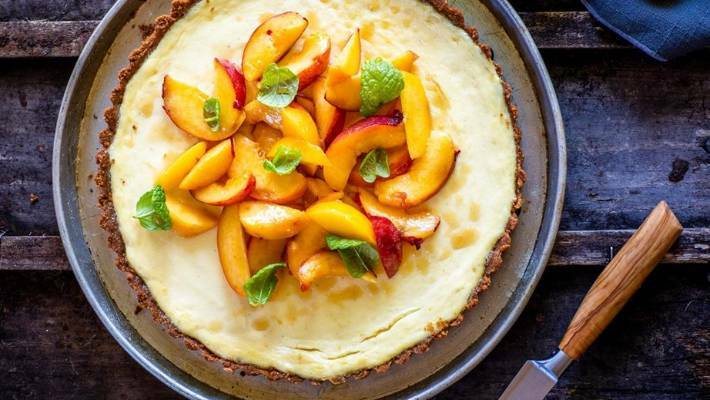 Slightly cheese-cakey, this Nici Wickes tart is a fantastic gluten-free dessert for the summer. Top it with fresh seasonal fruit and that divine ginger syrup! 1. Preheat oven to 180°C. Grease a 23cm fluted, loose bottom tart tin. 2. Process the biscuits and almonds in a food processor until a fine crumb forms. Add in the sugar and melted butter, mixing thoroughly. Press this firmly into the tart tin, going up the sides as well. Bake for 10-15 minutes until set. Reduce oven to 160°C. 3. Whip the cream cheese until smooth. Add the sour cream, egg, sugar, vanilla paste and lemon zest, beating until smooth. Pour mixture into the crust and bake for 15-20 minutes or until just set. Leave to cool in the oven, then chill. 4. Make the ginger syrup by simmering the sugar, water and ginger until a syrup forms – about 7 minutes. Remove the ginger and allow to cool for a few minutes before adding in the fresh fruit slices. 5. To serve, pile the fresh fruit in the centre of the tart, drizzling the last of the syrup over. Scatter with mint leaves. Instead of gingernuts, you could use 2 cups of almonds and add in 2 tbsp melted coconut oil and 1 cup of dates to help bind it all together.